We appreciate your feedback about your support experience with Lucas Stark, developers of Bulk Variation Forms. This helps us maintain high standards on the WooMarketplace, and helps Lucas Stark improve. 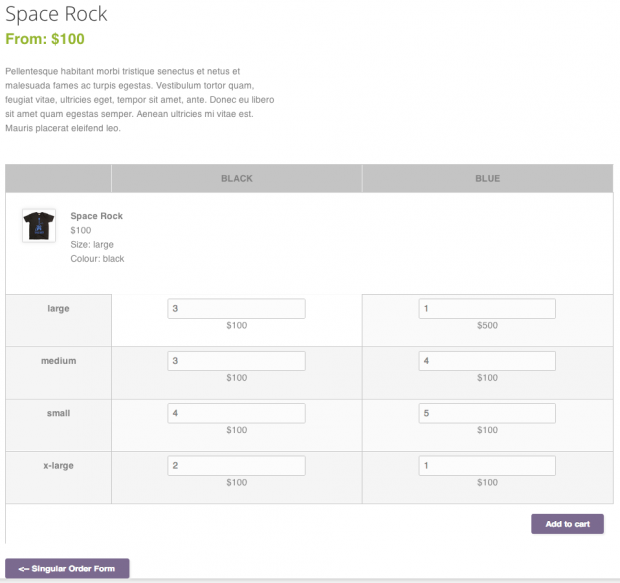 WooCommerce Bulk Variation Forms allows your users to add multiple variations of a product to their cart from single form. Easily configure products which have two variation attributes for bulk input. The bulk form will simplify the ordering process for wholesales, business to business sites, or any user who would like to order multiple variations of the same product at the same time. Shoppers always appreciate having a simple and efficient way to order products from your shop. Bulk Variation Forms makes it easy and convient for them to order everything they need to quickly. A clothing store who tailors to wholesale clients. These clients need to order multiple variations of your product when submitting their order. An online food retailer selling canned goods available in different size cans. A business to business site selling electronic cables in several different length. Any business that has products for which the user may want to purchase more than one variation of a product in a single order.